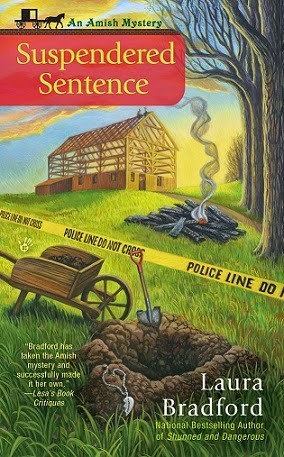 Laura Bradford joins us today to answer questions about writing and her new Amish mystery, Suspendered Sentence. Don't forget to enter the Rafflecopter post at the bottom of the page. To keep in touch with Mystery Playground, find us on Twitter +Mystery Playground and on Facebook. This might be cheating, because I’ve already met her (this picture of the two of us hangs on the bulletin board in my “office”), but it was brief so I’m going to say her anyway. 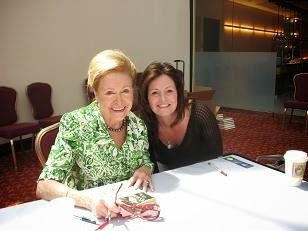 I would love to have lunch with Mary Higgins Clark. I’d love to ask her questions about her early career, tell her how much she’s impacted mine, and just enjoy spending time with someone I admire. Nineteen years ago, Sadie Lehman simply up and disappeared during her Rumspringa in the Amish community of Heavenly, Pennsylvania. Led to believe her daughter had gotten caught up in the English world by the girl’s peers, Waneta clung to hope that one day Sadie would come back. Yet while Waneta prayed for a reunion, Sadie’s friends hoped for something very different—that Sadie’s body would never be discovered. I saw that set up as plain as day (it came to me in the middle of a Panera, no less). What really happened that fateful night? Why did Sadie’s friends keep her death a secret? How could they let her mother believe she’d merely run off? How do you live with that kind of secret? The more questions I asked myself, the more excited I got by the answers I came up with. And, before long, I had the plot for SUSPENDERED SENTENCE (the 4th book in my Amish Mysteries). First, they’ve helped teach my daughters to reach for their dreams and work hard—a lesson they’ve embraced (I’m blessed). Second, it has been on this writing journey that I have met some of my dearest friends—people who came into my life because of my writing. It’s funny, but back when I was ten and dreaming of being a writer, the brass ring was seeing my name/my book on a library shelf. Now don’t get me wrong, seeing that for the first time was as cool as I’d imagined. But it’s the friends I’ve met along the way that have truly changed my world for the better. What did you do to research the book?? Every time I’m gearing up to write another Amish mystery, I spend a day or two in Lancaster County, PA (where my books are located). I go on tours, visit some Amish homes, and re-acclimate myself to the pace and the feel of that world. Since my protagonist, Claire, is English (what the Amish call us), she’s always learning something new about the Amish. My research trips help make sure that the things I have Claire learn are, indeed, accurate. For SUSPENDERED SENTENCE in particular, I had to do a lot of research on Pennsylvania law. I picked the brains of a fellow writer (who happens to be an attorney), and utilized some connections specific to Pennsylvania, as well. What I discovered, surprised me, and really helped shape this story. Thank you Patricia! We had fun making up the questions and Laura was generous to answer them. A great interview and sounds like a good book also. Thank you PT! Hope you have a great day. Deborah, thanks for hosting me here today. It was a super fun interview to do! Thank you for stopping by Laura! Can't wait to read the book. Sounds like a great book. I have been to Lancaster, PA myself. Great interview. Book looks great. Thanks for the opportunity to learn more about Suspendered Sentence and author, Laura Bradford. I would be so happy to have a copy to read. Great idea for starting the book. This one is not to be missed! Looking forward to reading it, and thank you for the chance to win!